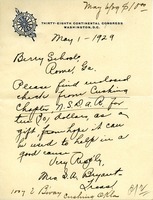 Contribution of $10, received December 18, 1929, from Mrs. S. L. Heath from the Baron Steuben Chapter of the DAR, Bath, New York. 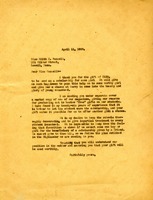 Thank you letter to the Aurantia Chapter for $100. Clippert sends Thanksgiving wishes and regrets that hard times and poverty in her own city prevent her from sending a larger contribution. 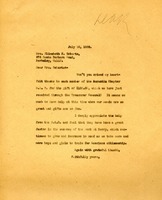 Raymond L. Wolven, Chaplain to the Bishop of Washington Cathedral, writes to enclose the Bishop's contribution. 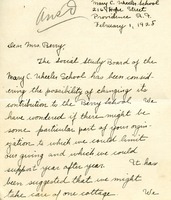 As secretary of the Social Study Board of the Mary C. Wheeler School, Eastwood inquires about the possibility of targeting their contribution to Berry to a specific purpose. 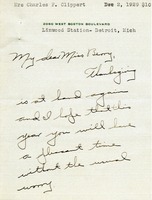 Katherine S. Mooney writes on behalf of Mr. Howard B. Tuttle, enclosing his $200 contribution. C.W. 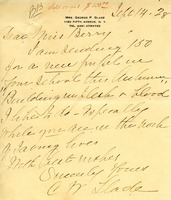 Slade encloses $150 for a new pupil. Miss Berry explains how the contribution of the donor will be used for the students. 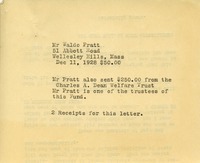 A contribution of $20.00 from the Pro Christo Society of Park Place Congregational Church.